Looking to pair paid transactions with contact data in Hubspot? Revenue Conduit's tracking script will pair the order data to the Hubspot UTK token. HubSpot tracks all of your anonymous website visitors with their special tracking cookie. Through Revenue Conduit, once those anonymous site visitors check out in your shopping cart and become a customer then you'll have their name, email, and all other purchase data in HubSpot. However, HubSpot can't know which anonymous HubSpot tracking cookie should be paired with which customer's information, so Revenue Conduit's software needs to pair that data together at the time of purchase! When an order is placed, Revenue Conduit will create a "'Revenue Conduit Tracking Form"and pair it with the Hubspot UTK token in which it belongs. This means that we have identified the individual that made the purchase and have correlated any previous cookies that Hubspot detected from your site (which is stored on Husbpot's back-end) and we will associated it to the Hubspot contact record for you to view. Any of the other forms not labeled "Revenue Conduit Tracking Form" are not tracked by us. You would need to contact Hubspot directly to find out about those other various forms. If you are using the Sales portion of Hubspot only, this does not apply to you (please skip) as we won't have the ability to track and pair the purchase with the Hubspot UTK token (this version does not have access to forms which is where you would have to set the permissions needed for RC to track this information). Notice the form will have no "Views": we're automatically submitting this form on your customer's behalf through the API to stitch their profile data together, so your customers will never see this web form. 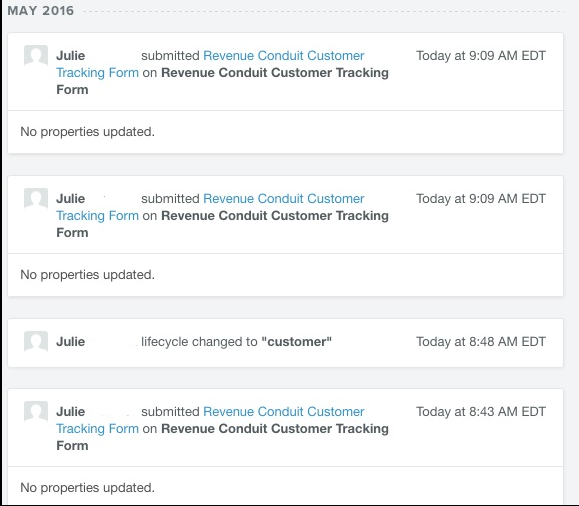 Why does the Revenue Conduit Customer Tracking Form sometimes appear multiple times on the contact record? Every time an order's status is updated, it is notated on the contact record. For example: if an order is pending, then moves to paid and then to a completed status, you may see the activity 3 times as displayed in the image below.